Trailer: Ted / It's Just Movies Trailer: "Ted"
Everyone, at one time, had a childhood dream — to be a princess, to go to Mars. But what would happen if that childhood dream came true, and what impact would it have on your adulthood? That’s the premise of “Ted,” the big screen directorial debut of “Family Guy” creator Seth MacFarlane about a grown man and his foul-mouthed stuffed animal. As a child, John (Mark Wahlberg) wishes that Ted (voiced by MacFarlane), his teddy bear could talk. His wish comes true, which at first makes for an adorable friendship between a boy and his favorite toy. But as John grows up, so does Ted. 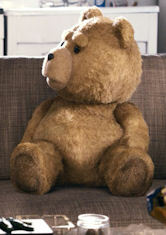 No longer a cute plush toy, Ted is a womanizing, foul-mouthed slacker who still lives with John. But as John pursues his ideal woman, Lori (Mila Kunis), and dreams of starting a life with her, Ted’s obnoxious behavior threatens to prevent John from ever really experiencing his adulthood. I’m not a huge fan of “Family Guy,” and as “Ted” is written and directed by MacFarlane, his signature humor is all over the trailer. The absurd story likely won’t attract many people outside of MacFarlane’s core fan base, but his fans will likely support him in his move to the big screen. Hollywood it-girl Kunis and Wahlberg tackling a comedic role should also be draws for the film. “Ted” hits theaters July 13. Check out the trailer below. There is a Red Band trailer that shows off how truly foul this movie is going to be and I think it looks hysterical. Nice preview Alexa. As you note, you’d probably have to be a McFarlane fan. The project idea has potential, but I didn’t see anything at all funny or fuzzy in this trailer.